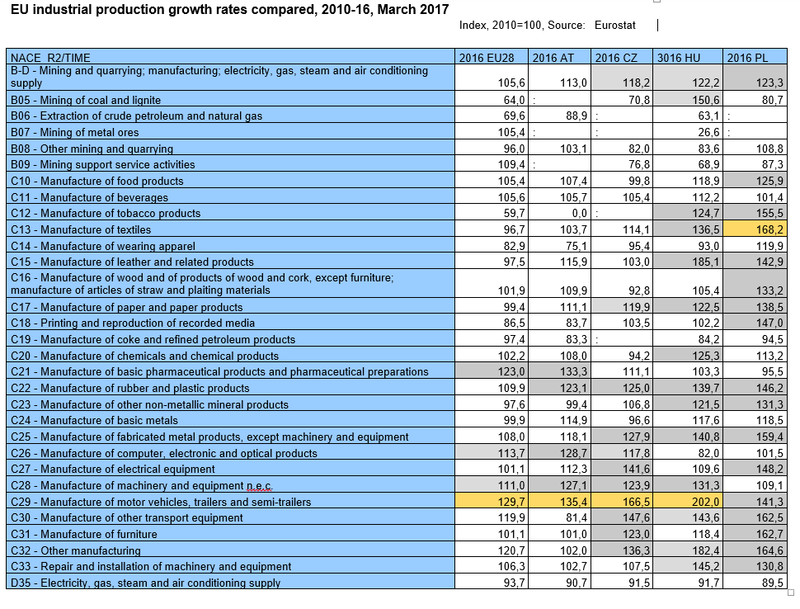 Eurostat data on EU28 industrial production growth in the period 2010-2016 show that with a 29.7% rise, the highest increase in industrial production was recorded for the sector "Manufacture of motor vehicles, trailers and semi-trailers". "Manufacture of basic pharmaceutical products and pharmaceutical preparations" (+23.0%), "Other manufacturing", which mainly covers manufacture of medical and dental instruments and supplies (+20.7%), "Manufacture of other transport equipment" (+19.9%) and "Manufacture of computer, electronic and optical products" (+13.7%) also registered a two-digit increase over this time-period. 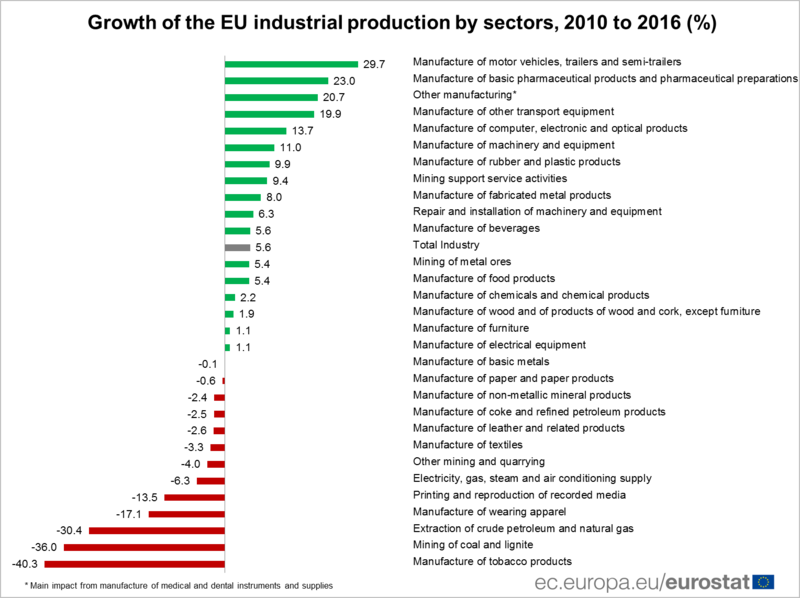 The largest decrease in the EU28 was recorded for manufacture of tobacco products and mining of coal and lignite. 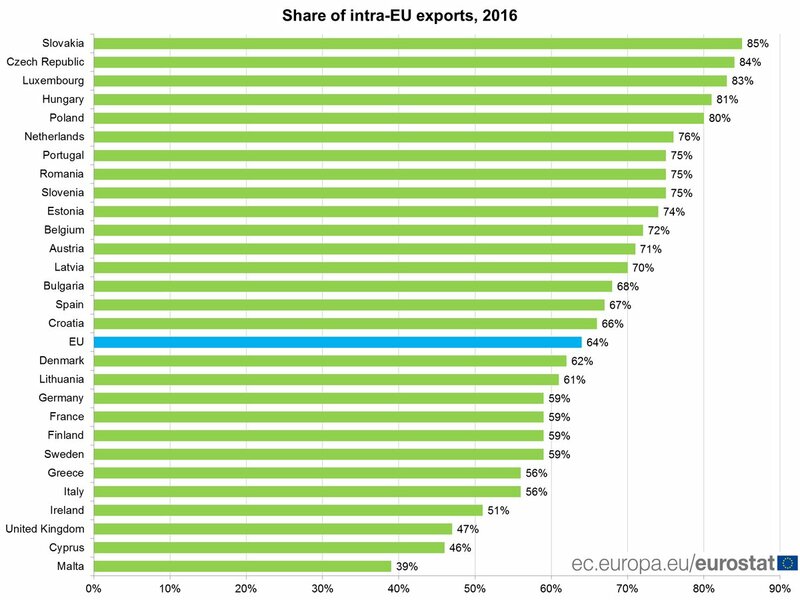 In the Czech Republic, the highest industrial production growth in 2010-2016 was reported in "Manufacture of motor vehicles, trailers and semi-trailers" (65.5%), followed by "Manufacture of other transport equipment" (47.6%), "Manufacture of electrical equipment" (41%) and "Manufacture of fabricated metal products, except machinery and equipment" (27.9%). The largest drop in industrial production was recorded in "Mining of coal and lignite" and other mining related industries. Regional comparison is available below. Read more details and view infographics.